Our customers tell us productivity is at the forefront of their minds. With added productivity comes reduced costs, a more profitable organization, and a happier workforce. Central to a company’s productivity is communication through a cloud phone system. Cloud phone systems are modernizing the way our customers communicate and in turn, are transforming how they operate. One of the biggest differences between a traditional phone system and a cloud phone solution is the ability to make changes yourself without calling in a phone technician. This can be anything from adjusting your auto attendant options, adding custom messages for after hours or holidays, adjusting your answering rules or even changing your hold music. One of our customers told us that every time he needed to adjust his auto attendant settings to adapt to onboarding employees, it would take 2-3 days for his phone system vendor to get someone on site to make the changes. With a cloud phone solution, you have control over your phone’s features and the ability to makes necessary changes right on your browser. This saves time, money and allows for far more flexibility on your end. Cloud phone solutions have the ability to connect employees whether they are in different offices, in the car or at the cottage. Softphones turn your laptop, cellphone or tablet into a fully functioning, feature-rich business phone. This keeps employees available and equipped with the communication tools they need wherever they are. This makes supporting remote workers, changing office locations and implementing Bring Your Own Device (BYOD) policies feasible and seamless. Take our customer that manages a national hardware store chain in numerous locations for example. Our cloud phone system connects their phone system so they have the same phone number across all locations. At the end of the day, employees are no longer bound to their office desk to be available in a professional manner and different company locations can be unified through integrated communication. 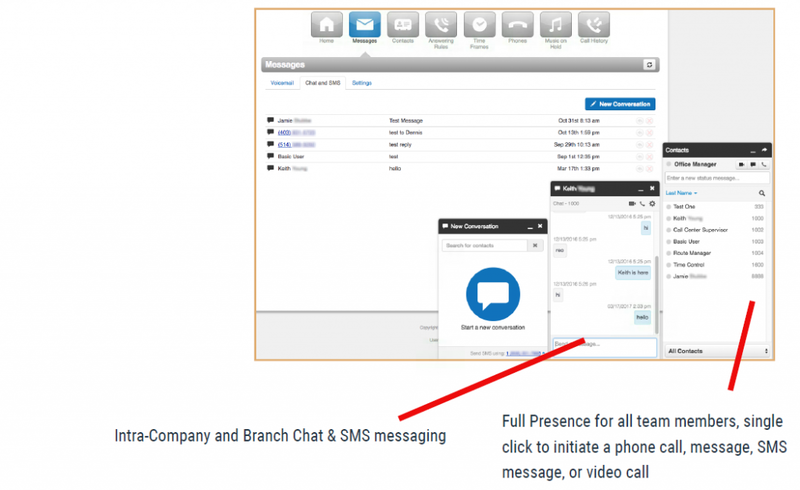 Another great thing about a cloud phone solution is all the features that promote collaboration within your team. Things like the chat feature, Find-Me Follow-Me, and transcribed voicemails make your communication amongst each other more effective and more efficient. An Executive Director at a non-profit we work with is always able to quickly respond to questions from key donors because the calls come to her desk phone while she’s in the office and her mobile phone while she’s at events. No matter where she is, the call gets to her and if she misses it, it is transcribed into an email so she can check it quickly. The beauty comes from the ability to use different channels that all get integrated into one system. With a centralized system, employees no longer need to check various platforms and minimize the risk of missing important messages. Cloud phone solutions have the ability to fine-tune your operations and make your business more productive. This technology will have an immense impact on your day-to-day and is a must consider for anyone looking to improve their communications. If you have more questions about cloud phone systems and how they can be curated to boost your company’s productivity, feel free to contact SelectCom.